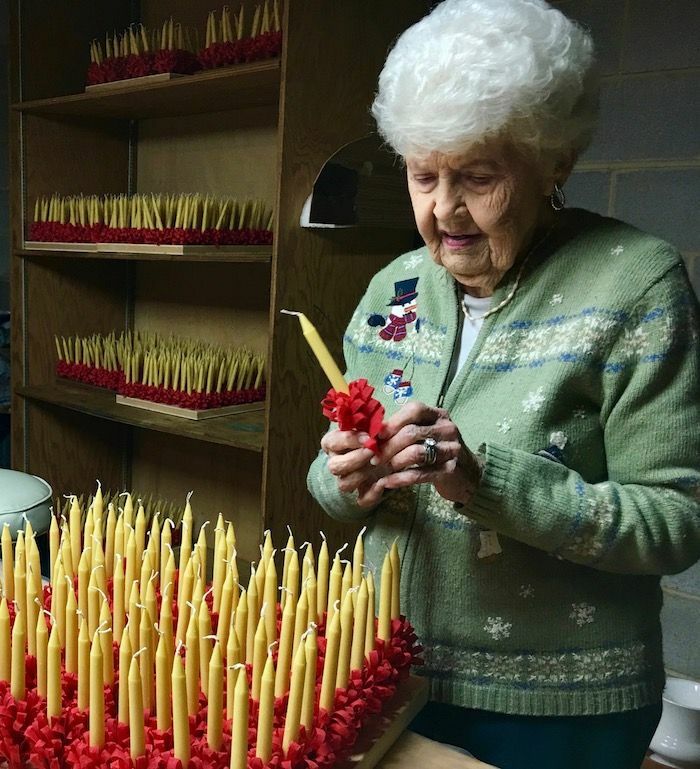 Every year, as the weather turns cooler and December approaches, 94-year-old Mary Dull fills her home with thousands of handmade beeswax candles, wrapped with red crepe paper trim and made with love, destined for Wake Forest’s annual Lovefeast. 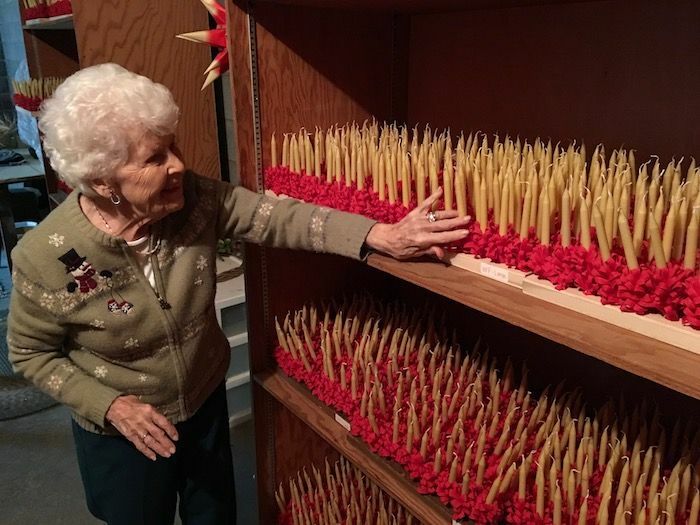 If you’re looking for traditional Moravian beeswax candles, all roads lead to Dull’s tidy home in the Salemtowne Retirement Community a couple of miles from campus. Call her the lovefeast candle lady. She’s the widow of Old Campus graduate Carl Dull (’39) and grandmother to Colin Edwards (’01) and Conrad Edwards (’05). 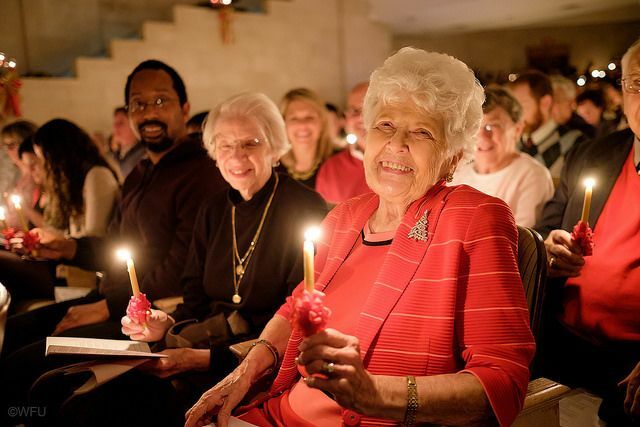 Dull has been making candles for lovefeasts at Wake Forest and area Moravian churches for as long as she can remember. “It’s in my heart. I love to do it.” Her husband used to tell her that her blood was melted beeswax. She’s quick to point out that she doesn’t make all the candles herself; that would be too much even for someone as energetic and dedicated as she is. 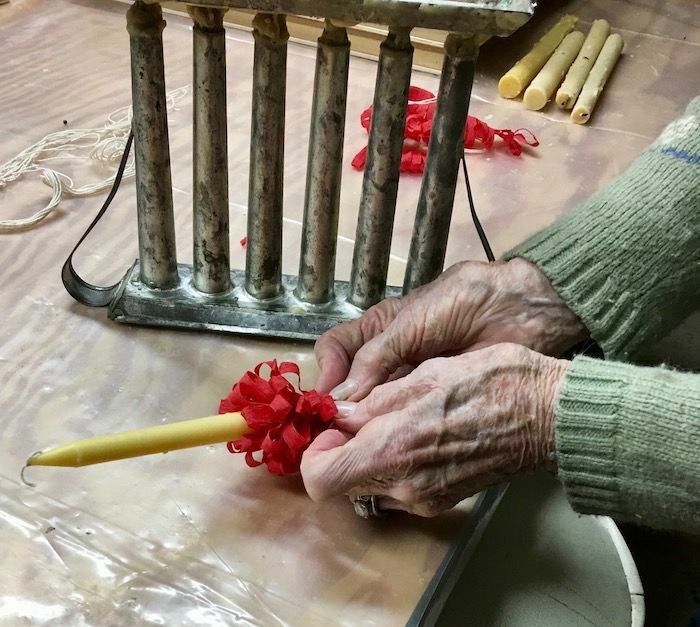 A group of volunteers from the Mary Ann Fogle Service League gathers at Home Moravian Church in Winston-Salem once or twice a month to make candles. The candles for Wake Forest eventually make their way to Dull’s house. I’m barely in the front door of Dull’s home when she leads me to her basement candlemaker’s space. She’s wearing a snowman sweater, but she occasionally wears a shirt with “There’s nothing dull about us” printed on it. That’s certainly true of Mary. She’s a live wire, given to frequent outbursts of laughter as she drops one-liners, interspersed with the history of Moravian lovefeasts. About the only concession to her age is a chair lift that whisks her downstairs. You wouldn’t know that she’s 94 as she flits around the sparsely furnished cinderblock basement. A table holds candle molds and scraps of red crepe paper. 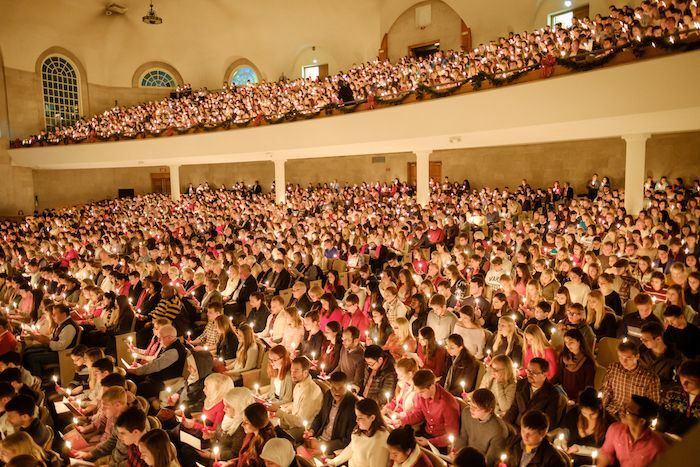 With less than a week until Wake Forest’s Lovefeast, 40 trays marked “WF” and holding 100 candles each are stacked on shelves. “I’m crazy enough to keep ’em here” until the trays are delivered to campus, she laughs. When I mention that she has “about” 4,000 candles in her basement, she quickly corrects me. 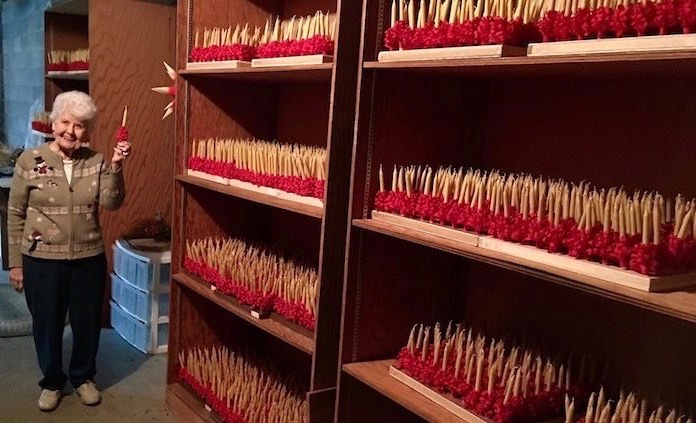 “I know that I have exactly 4,000 candles here,” she says, before apologizing that she can’t give me one to take home because that would mess up the count. As we’re talking, Dull can’t help but notice that some of the candles in those trays aren’t just right. She removes one — the red trim is just a smidgen too high — and another — the trim is a smidgen too low — and another and another. She unwraps the trim and deftly rewraps it so that it’s just right. “How’s that look?” she asks. “Because I’m the age I am, and I’ve done this a few thousand times, I know what I’m doing.” She was up until 1:30 this morning doing her own quality control. Dull and other volunteers take orders for candles from Moravian churches throughout the area. “We run it like a business, you can’t just stand around and talk about your latest grandchild,” she says. People are willing to volunteer, “if you smile when you ask them.” She smiles so nicely that I’m about ready to volunteer. Candle making begins almost as soon as the lovefeast ends. Participants who don’t want to take their candles with them can drop them in collection boxes at the chapel doors to be recycled. The candles are “undressed” by volunteers who remove the trim and chop off the burned part of the candle. Tallow is added to make the candles burn better. As she pours the hot wax into candle molds, she implores, “Please don’t leak, please don’t leak.” It doesn’t. “Hot dog!” she exclaims. She twists the cotton wick exactly 10 times so that it will burn better. Once the candles solidify, they’re ready to be “dressed” with the red ribbon. Wake Forest and churches buy the candles from the Mary Ann Fogle Service League. After expenses, the proceeds are donated to the Resident’s Financial Assistance Fund at Salemtowne. For all her work making the Wake Forest Lovefeast special, Dull usually doesn’t attend, although she did attend two years ago and had a reserved seat waiting for her. “I felt like Queen Elizabeth!” she says, laughing hysterically once again. Instead, she helps serve the lovefeast at her church, Home Moravian. But she is proud of the role that she plays in the Wake Forest Lovefeast. “I just like the feeling of the good that we do. When I finish a tray (of candles), I feel like,” she stops, pausing for the right word.